AMD released a statement timed to coincide with Apple's announcement of an impending MacBook Pro update. Apple will refresh the 15-inch MacBook Pro in November and it will come with a choice of mobile GPUs including the new AMD Radeon Pro Vega 20 and Radeon Pro Vega 16 graphics. AMD says these GPUs "deliver amazing performance in 3D rendering, photo and video editing, and other creative applications, as well as stunning 1080p HD gaming at ultra settings in today’s top AAA and eSports games". The new premium laptop GPUs are based upon the AMD Vega architecture, as per name. AMD says they are built on the 14nm FinFET process and are both powerful and efficient. Vega technology such as next-generation compute units (NCU) and Rapid Packed Math can speed along complex computations and heavy workloads. The GPUs are backed by their own HBM2 memory. 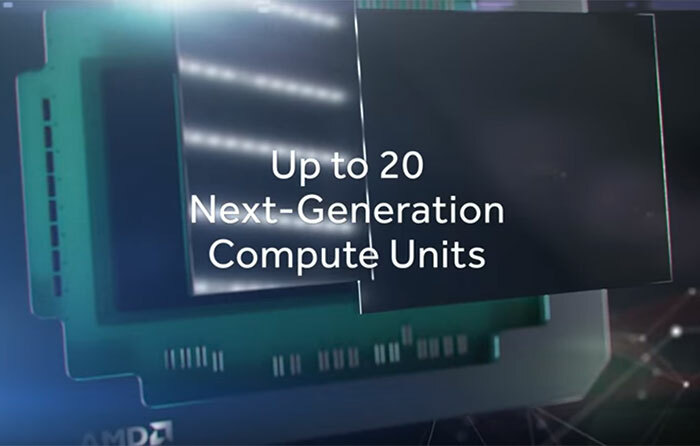 While the press release is light on details, thankfully the accompanying YouTube video confirms that the numerical suffix is an indication of the number of next-gen compute units in the GPUs. Thus the AMD Radeon Pro Vega 20 has 20 CUs and 1280 Stream Processors (and the 16 CU model has 1,024 Stream Processors). In the Apple press release about the new MacBook Air, it briefly mentioned the news that Radeon Pro Vega Graphics are coming to MacBook Pro next month. According to Apple's own testing, AMD's Radeon Vega Mobile solutions "deliver up to 60 percent faster graphics performance for the most demanding video editing, 3D design and rendering workloads". At the time of writing we have no information about Windows-based laptops coming equipped with the Radeon Vega Mobile discrete graphics processors. However, AMD previously has publicised Vega Mobile as a solution for laptops in general, so it looks likely that PC systems makers will equip these GPUs as options in select laptop models. So the same 24 CU chip that Intel put on their multi chip module but with a few CUs fused off? If looks the same size in the photos, and the Intel chip is bound to just use PCIe to interface even within the same chip package. No that chip was Polaris with Vegas memory controller, this is full fat Vega. How do those compare against nVidia mobile chips. In practice, nVidia chips dominate by market share, amd since there is more to a laptop than just the GPU, and through that alone it is likely that the laptop that is a best match to my requirements will have an nVidia GPU, but I am curious as whether AMD has made any progress on the mobile front. Somewhere between 1050 and 1050ti I think. It wouldn't really be comparable with anything in the Geforce lineup as these are ‘Pro’ class GPUs, they'd be more comparable to Quadro or Tesla mobile (are there Tesla mobile chips? ).